I’m thrilled to be advising Joint Futures. While the practices of craft (what we make), operations (how we do it), and strategy (impact, differentiation, and value) are equally important – combining and considering them together can achieve so much more. That’s why I’m helping shape the experience of this event, together with Clarity, DesignOps Summit, and other conferences! There’s immense value to thinking holistically. Teaching a class at California College of the Arts called Transition to Professional Practice. I’ve guest lectured and critiqued at CCA but have never taught a full semester until now. Spring semester here we come! December 23, San Francisco, CA — Taking stock of my year, it makes me happy to have shared what I’ve learned on five national and two international stages. It was terrific to be at HOW Design in Boston, and to hear such a variety of successful stories from people like Emily Cohen, Adam J. Kurtz, Josh Higgins, and Stephen Gates. I brought a 20-minute version of the People Layer to the Google Design Sprint conference. 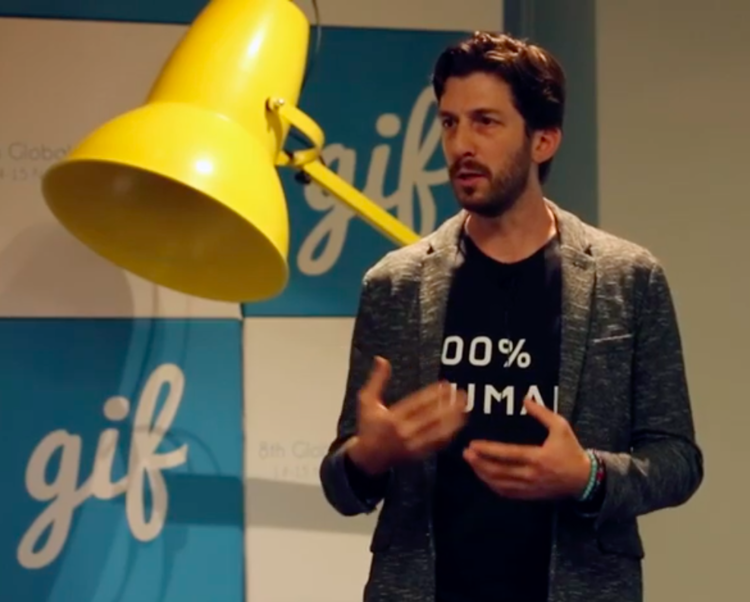 And I spoke at Designers + Geeks and Otis College [see below]. In Bucharest, I was the only designer to speak during their Tech Week. And at the GIF London summit, I learned about Google’s A120, connected with exciting strategists and thinkers in the UK, and have plans to return in 2019 for a workshop and a visit to the Imperial College of Art. December 12, New York, NY — Jina did such a fantastic job with this year’s Clarity conference – the third version of the single-track design systems conference, and its first time being in New York. It was the most intersectional, female-led gathering I’ve attended. And I love that it was well spaced-out (not just the type, haha). A tip of the hat to Nathan who jumped in last minute to emcee. A few months before planning kicked into full swing, Jina and I got together to update the typography, so that it could be, well, more clear. I customized Brandon by lowering the bar in the A to visually connect to its neighbor in the R. Love how it turned out! December 7, San Francisco, CA — To expand the community we don’t yet know, and give back to the community we know and love, my pal Arianna and I experimented with offering free Office Hours. We were absolutely thrilled at the response! In a matter of a few minutes, the time slots were filled up. Over a few months, we connected with emerging designers and with professionals at a turning point in their career. We spoke with individuals in São Paulo, Philadelphia, Vancouver, Portland, Hyderabad, and the Bay Area. We really enjoyed the conversations we had, and we were happy to receive feedback that the conversations were useful. And it brought a comfortable, repeatable structure to our weeks. Look for more in 2019! Coaching works! 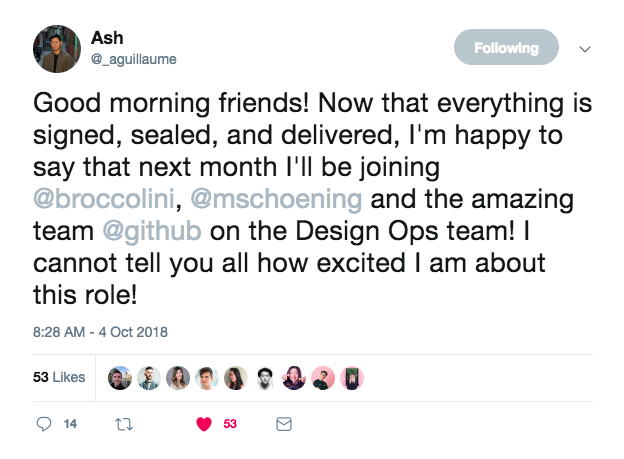 I helped @_aguillaume present the story that got him a job in the DesignOps team at Github. November 2, Los Angeles, CA — To celebrate the first year of international conversations created to celebrate queer people, my partner and I designed and produced the first issue of Qwarterly. Among pride photos and illustrations in 40 pages of all original content, there’s a profile of Gilbert Baker, the creator of the pride flag, an interview with Cecilia Chung, a trans politician, and interviews with the three bands selected to perform at Mighty Real, a party invocation of Sylvester at the Peppermint Club in Los Angeles. Whew! It’s a very special experience to see everything come together and get jazzed up from its humble origins. August 30, Los Angeles, CA — For the very first time, the Communication Design program at Otis College of Art + Design convened a week-long charrette to explore and investigate one theme: citizenship. Interdisciplinary students, faculty, and staff – including Sheharazad, their newly-hired Creative Director – mixed with four visiting artists (two illustrators and two designers) who added their perspective to the topic. The week’s activities were cumulative – it was an honor to be in the mix, and to enjoy the bonus activity of synthesizing the work. Silas and I strategized approaches & structures for about a month leading up to the charrette week. Mary prompted the students to think small and concentrate their message. And on my day, students clustered around topics such as belonging, unity, empathy and sharing a meal. There was a palpable buzz in the room as faculty floated from table to table offering critique and ideas, and students iterated and refined their approaches whilst figuring out how to collaborate with each other. Table by table, risograph posters were produced as evidence for further explication. I’m always impressed with what can be accomplished over one day. As a participant and lecturer for this first instance experiment, I’m eager to see where Otis takes it next.